We’re big fans of meatballs around here: I tend to make them when I want something meatloaf-ish on a shorter time-frame. The problem with that idea is that my preferred recipes call for slowly roasting the meatballs in the oven, which actually takes longer than meatloaf; or else a combination of browning on the stove-top, baking in the oven, and then simmering in sauce, which may not take longer total time than a meatloaf, but is infinitely more fussy. Still, there is something so homey and appealing about them that I keep seeking out new recipes to try. This one was a spin on Moroccan kofta, which can be anywhere from walnut-sized to softball-sized, or even molded into a cigar shape around a skewer for kebabs. I don’t think it is an especially authentic recipe, but it was tasty, and if I make it again, I will use more spices; it calls for a rather sparing hand and the seasoning was almost too subtle to detect. To go with my pseudo-kofta, I made a pseudo-tabbouleh salad, cooking bulgur wheat in my homemade chicken stock and tossing it with lightly sautéed lemon cucumber, purple bell pepper, and sweet onion. Some freshly chopped mint and parsley, and hearty splashes of lemon juice and olive oil, completed the salad, which I chose to serve while still slightly warm. I suppose this should be really be called a tabbouleh-style pilaf, but whatever it was, it complemented the kofta nicely. The combination of lemon and fresh herbs was refreshing and the vegetables were at that point of tender-crispness, neither raw nor mushy, adding a stunning array of colors to the otherwise brown and white plate. Most tabbouleh recipes call for chopped tomato, but I didn’t have any on hand and wouldn’t have included them in any case, as raw tomatoes are not a family favorite. For a final unifying touch, there was yogurt sauce to drizzle over the plate, seasoned with lemon, garlic, and some freshly made sesame paste. My little spice grinder didn’t handle this chore as well as I had hoped, but I only made a tablespoon or two and I think more bulk would have helped. The finished sauce was consequently on the gritty side, but it had a very pleasant roasty-toasty undertone from the seeds that added depth to what would otherwise be your basic garlicky yogurt sauce. 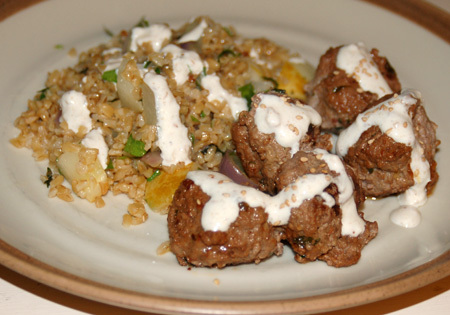 For the kofta: Combine the first 8 ingredients in a large bowl. Shape into 2-tablespoon balls. Heat a large heavy skillet over medium-high heat and drizzle in some oil. 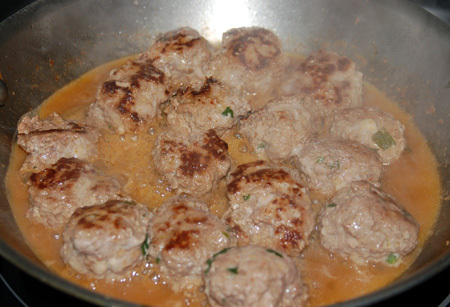 Add the kofta to the pan and cook until browned on both sides. Reduce heat to medium, add the chicken stock, cover, and allow to steam for several minutes more, until the meatballs are cooked through. Remove the lid and allow any remaining stock to reduce away. To prepare the sauce, simply combine the ingredients in a medium bowl. Advance preparation will allow the flavors time to meld. If you want to make your own tahini or sesame paste, toast a tablespoon or two of sesame seeds in a small skillet over medium heat, tossing regularly to brown evenly (and watch them like a hawk, because they will burn if you blink); then process them in a spice grinder or small food processor with a drizzle of neutral oil (or sesame oil!) for lubrication until they form a smooth paste. Making a larger amount will facilitate this process. For the tabbouleh-style pilaf: Place the bulgur and water or stock in a large pot and bring to a boil; reduce the heat, cover, and simmer until all the liquid has absorbed and the grains are tender, about 20 minutes. Transfer to a large bowl. Meanwhile, drizzle some olive oil into a skillet and sauté the cucumber, bell pepper, and onion until tender-crisp, adding the garlic in the last minute or so. 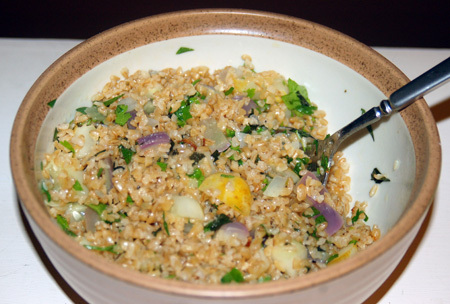 Dump the vegetables over the cooked bulgur, add the fresh herbs and stir to combine. Add about a quarter cup of lemon juice (about one lemon’s worth) and roughly the same amount of olive oil to the mixture. Season with a hefty pinch of salt, stir everything up again and taste; adjust if necessary. Serve warm, room temperature or chilled, cook’s choice! Source: Adapted from Semi-Sweet and The Kitchn.